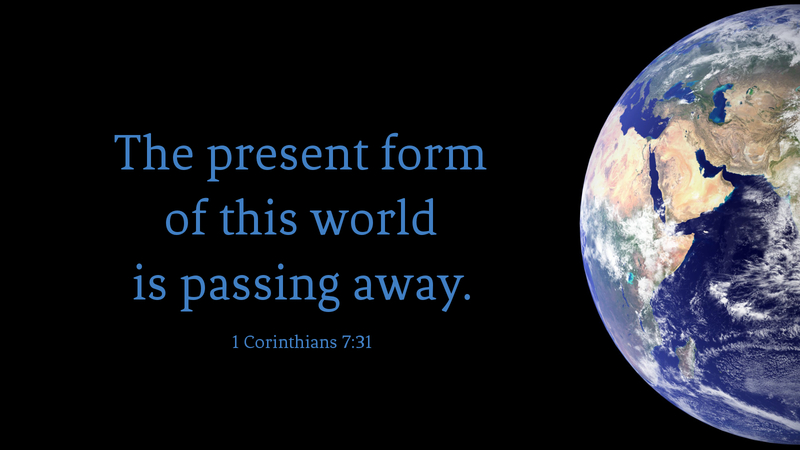 “For the form of this world is passing away” (1 Corinthians 7:31). There are days when we wish that this were true—that the form of this world is passing away and Jesus will come again—soon! We get impatient, at times, with this old world that seems so full of injustice, chaos, violence and hatred. Well, maybe Paul isn’t so trustworthy on this, as the day of the Lord did not come as quickly as Paul expected. And we’re still waiting. We’ve been waiting so long that many no longer think about or question how we are to live as we wait for the day of the Lord. And yet, what St. Paul says is true: The form of this world is passing away. Day by day, we are one step closer to Jesus’ return in power and glory, even as we are one day closer to our own sure and certain death. This world is passing away, and we are coming closer, ever closer, to the end of earthly days. But the reality of this is not intended to make us sorrowful or afraid. Rather, it is to give us hope that human history will culminate in the end that God intends, so that, finally, all will be caught up in Jesus, who is the Beginning and the End, the Alpha and the Omega. This is the future we have been promised, and the future we yearn for—the fulfillment of all things, in Jesus Christ. This Lenten season, let us look with joy for signs that the form of this world is passing away, and let us give thanks that God has for us a hope and a future! Prayer: Almighty God, bring us at last to Jesus Christ, the Alpha and the Omega; our present hope and our future joy; through the same, Jesus Christ our Lord. Amen.